A Jewish man has won his fight against a German museum for the return of thousands of rare posters stolen from his father by the Nazis in 1938. 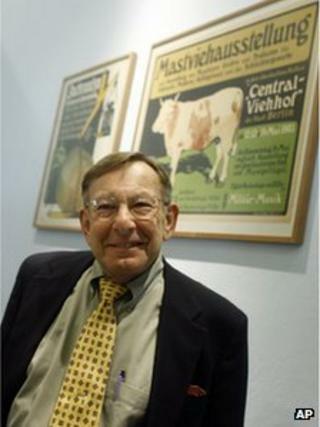 The Federal Court of Justice in Karlsruhe ruled Peter Sachs, who now lives in the US, is the rightful owner of the posters. The judges said that not returning the posters "would perpetuate Nazi injustice". "I can't describe what this means to me on a personal level," Peter Sachs said. The Berlin museum said in a statement that it "accepts the ruling", bringing an end to the seven-year legal battle. "Based on the ruling, the foundation will soon meet with Peter Sachs to arrange a rapid and mutually agreed solution of the ownership issues, and who holds them." Hans Sachs, who managed to escape to the US after being held in a concentration camp, is thought to have collected up to 12,500 posters, of which only 4,529 have been identified. The German Historical Museum only displayed a few posters at any one time after becoming part of its collection following the fall of the Berlin Wall. But it argued the collection, which includes advertisements for exhibitions, cabarets, films, and political propaganda, was invaluable to researchers. Peter Sachs, 71, only became aware of the collection in 2005, and immediately began legal proceedings to get them back. In an email to news agency the Associated Press, Peter Sachs, said: "It feels like vindication for my father, a final recognition of the life he lost and never got back." His lawyer Matthias Druba, said: "Hans Sachs wanted to show the poster art to the public, so the objective now is to find a depository for the posters in museums where they can really be seen and not hidden away."